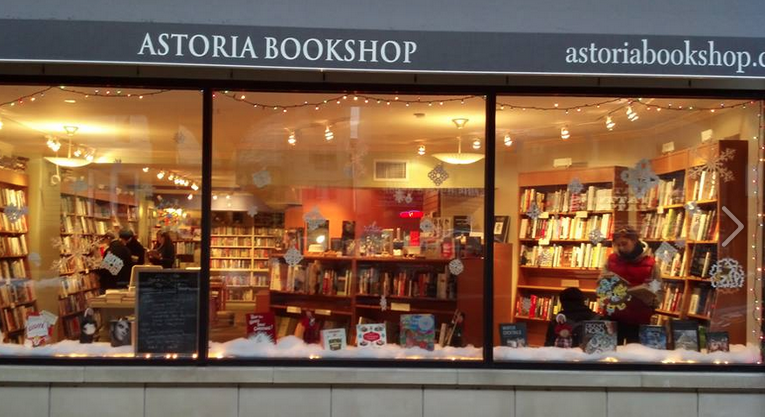 Last week we heard the good news—the Astoria Bookshop has been chosen by Publishers Weekly as a finalist for the 2018 PW Bookstore of the Year Award. The award has been given each year for the past 25 years, so it’s a well-established honor. This is a big deal and we are really excited for them, and hope they emerge as the winner; we know the bookstore has a huge fanbase in the neighborhood and know there are many people rooting for them. As to what she thinks makes Astoria Bookshop a standout, she mentions their devotion to the Astoria community and all the wonderfully diverse demographics within. “I work very hard to tailor our inventory to what our customers are looking for,” she remarks. She notes that the needs and desires of their customer base often changes from month to month as new authors emerge, new trends become apparent, school curricula change, as well as the fact that their customer base continues to grow. All of these aspects help her to make relevant choices that satisfy and excite her customers. She also tells us that it’s been a priority from the Shop’s early days to give back to the community—this is done through donations to raffles for local schools, offering discounts to local book clubs, and fundraising campaigns like their ongoing “Blind Date with a Book” promotion. She’s also implemented less conventional strategies like selling Ta-Nehisi Coates’s Between the World and Me at cost for the first two months it was out. “As a small business, my margins are small but I have a lot of personal control over what books to promote and where to throw a little money when we have it,” she says. Harry Potter Book Night celebration on Thursday, February 1, with Fantastic Beasts Bingo and prizes and cosplay and fun stuff. Congrats again, Astoria Bookshop, for being named as a finalist for this wonderful award! The winner will be announced in late March and also featured in the pre-BookExpo edition of Publishers Weekly magazine. The awards will be presented at BookExpo over at the Javits Center. Congrats! Love this place! I sometimes take my daughter for Storytime on Thursday mornings! Did they win?! ?